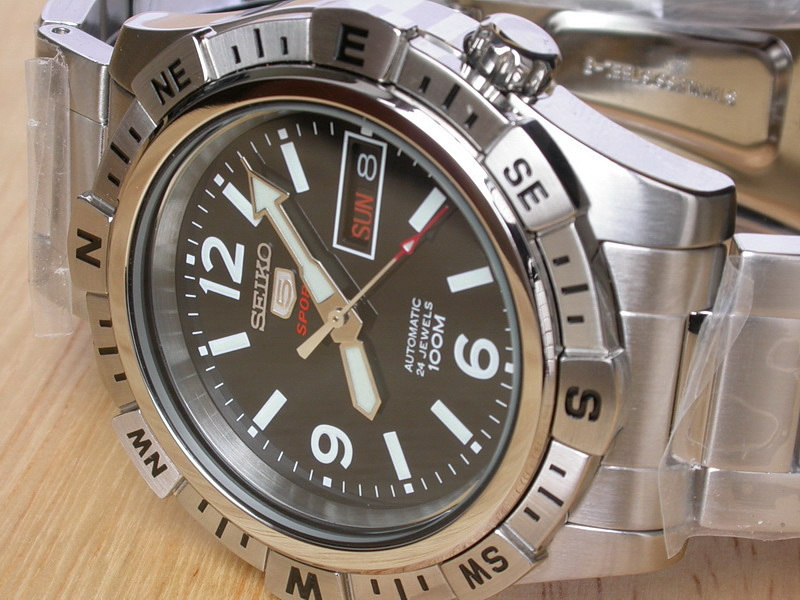 « Smiths Diver PRS-68 Review – The New Seiko 6105? The introduction of the 4R36 movement from Seiko brought with it a relatively large tide of new models in the Seiko 5 Sports range. Previously, the majority of the Sports offerings were equipped with the 23 jewel 7S36 calibre, a 2 jewel upgrade over the standard 7S26. 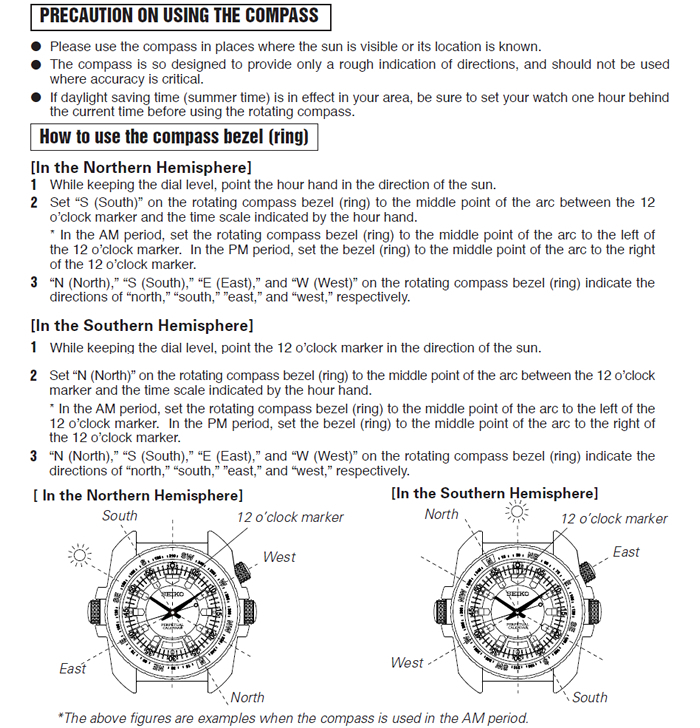 I have in a previous post had a brief look at how the 4R36 came about and its relationship to the both the 6R15 and the 7S26 – the crux of the matter is that we now have available a range of Seiko models which are a cut above standard Seiko 5s in terms of movement specification and fit and finish. ‘Range’ is the operative word given that the styles that have been released over the last two years or so cater for just about every taste – from the more reserved through to the more gaudy (for want of a better phrase). This post deals with one of the more reserved designs which I feel is a watch that suits all occasions but has a little, but loveable quirkiness. 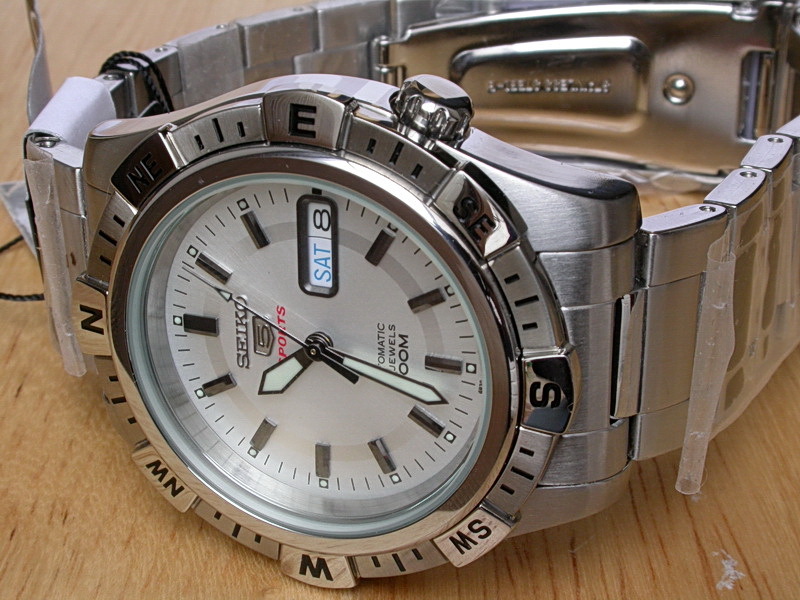 Specifically, this is the Seiko SRP135K1, one of the earlier releases which appeared sometime in late 2011. At first sight, this watch looks to be a pretty standard, relatively non-descript timepiece but therein I feel lies its beauty. If you are looking for a Seiko watch which won’t look out of place in any situation then the SRP135 would appear to fit the bill. One reason for the latter statement is that this watch is reasonably sized when compared to some of the huge offering on the market these days. No ‘saucer on the wrist’ effect here! hey presto, the bezel now shows you North, East, South and so on! Digression over and the watch case itself is of a standard design, with 20mm lugs allowing for easy change to a strap if you so wish. Finish is very much standard with the case top being finely brushed and the sides having a very good standard of polished finish. The combination of brushed/polished finish extends to the bezel too, which features ‘rider tabs’ at 45 degree intervals and I cannot help but be reminded of Breitling whenever I look at it. The aforementioned rider tabs are polished with the rest of the bezel being brushed with black infill to the markers. At first sight, one might be forgiven for feeling that the lugs are a little thick; would the watch be better with a 22mm lug width? This is a watch that looks better in the metal by far and the chunky lugs give a certain degree of heft so I think that 22mm lugs would themselves look odd on the wrist. The quality of finish is without doubt better than your everyday Seiko 5, certainly in terms of the polished areas. For an exquisite case polish then we can look no further than a Rolex; this Seiko can’t be compared but nonetheless is endowed with a more than respectable effort in this regard, particularly when one considers its price point. Now, a brushed finish is a brushed finish I guess but I have to say that the case of the SRP135 is very well done, fine and even. The SKX007 in comparison, has brushed lugs and these are often quite coarse (which is OK) but they can suffer from an uneveness in my experience. Given that this watch has more metal than a standard Seiko 5, then this has allowed for a wider case band when viewed from the side – thus negating the ‘stand tall’ effect often seen in lesser models (some SNX models spring to mind); so, although the watch is all of 12mm in thickness (not excessive anyway), clever division between the case back, case band and bezel mean that once on the wrist, the SRP135 is comfortable and doesn’t stand proud, with the caseback sinking into the wrist very well and thus losing some 2mm of the overall thickness. In profile, this Seiko has an attractive curve to the lugs which again, aids the visual reduction of the watch’s depth and serves to reduce the lug to lug distance of 46mm in terms of wearability; with regard to the latter, I was quite surprised on measuring this as on sight, it would appear to be no more than say 43mm. Suffice to say, the case design means that the SRP135 is eminently wearable by those with wrists as meagre as mine! 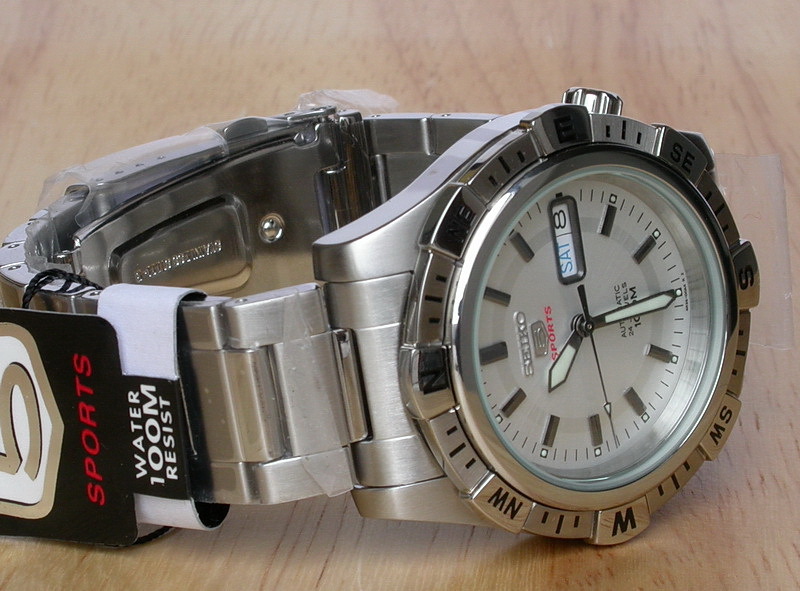 In line with the Sports 100m label, this Seiko has the Hardlex crystal but in a slightly thicker version than normal. Turn the watch over and we are presented with Seiko’s standard case back with six slots, laser etched serial number and of course, the display window. The case back ring is polished, matching the sides and nothing else to report there apart from the etched serial number of course which tells us the year and month of manufacture. 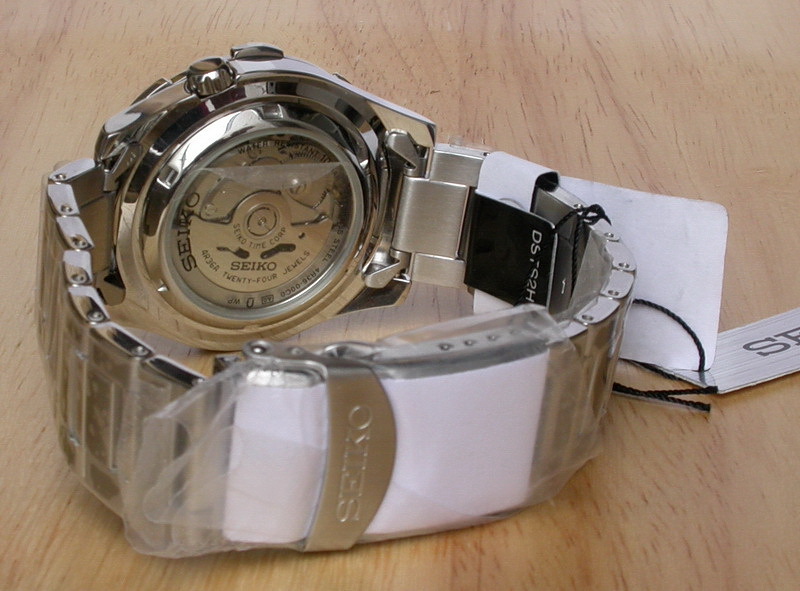 As a quick aside, Seiko 5 casebacks have changed twice since the late 1990s – traditionally, they were solid metal with all the watch details engraved right there on the metal, Seiko then introduced the clear case back with all the necessary information printed under the rear glass along with the serial number; finally, the switch was made to the current style with the srial number being moved to the metal ring (always directly opposite the ‘Seiko’ under the glass). Some readers may remember seeing an etched ‘5’ symbol under the front crystal, just above the 6 on some Seiko 5s – this was I assume, Seiko’s answer to the counterfeits which have become quite prevalent over the last fifteen or more years. 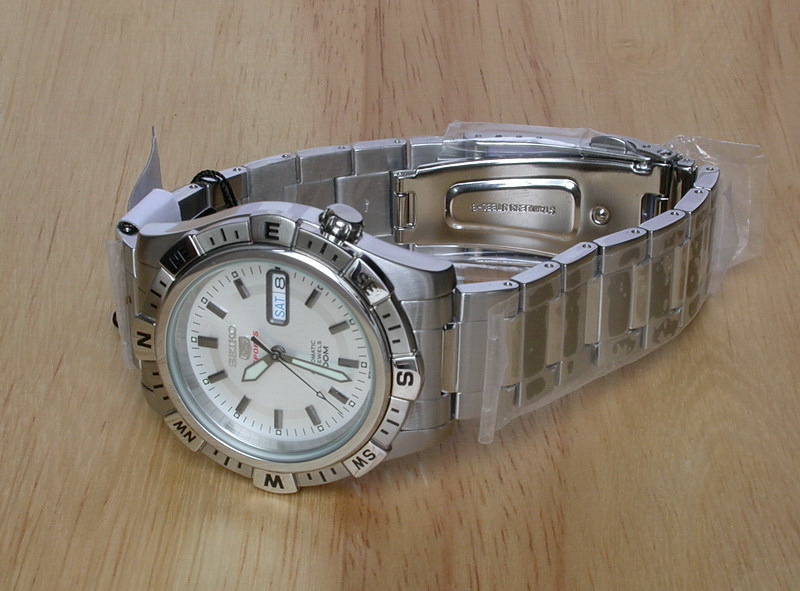 This idea was combined with the solid caseback and lasted until the introduction of the clear backs in the early 2000s. The crown is set at the 3.48 position as is the norm for many Seikos these days and is of all polished finish. Given its design and semi-hidden position then manual winding requires a little more effort than might be with a finely serrated, non-hidden example but nonetheless, the old trick of gently using the underside of one’s index finger works fine. The winding is very smooth and access to pull the crown out for day/date setting and time setting is easy as there is plenty to get hold of on the underside. The watch is water resistant to 100m without the aid of a screw down crown and I am more than comfortable with this (I have regularly been swimming with standard 5s with no issue). If the earlier 7S26 is anything to go by, the 4R36 should prove to be a long lived and robust movement and more than capable of powering an unabused watch for up to two decades with little intervention. Regarding the accuracy figure above, then real world experience reported by users has usually been far better than that stated. A daily gain of 3 to 6 seconds being not unusual. For the price point of a such a watch, this is more than satisfactory in my opinion and of course, if you are an accuracy obsessive then buy a quartz watch! In terms of execution, Seiko dials are, in my opinion, excellent for their price point. Surface finish and application of markings are almost always way beyond what one might expect and in many cases give watches costing ten times as much a run for the money. The sheer number of dial variations for some models (particularly lower end Seiko 5s) mean that collecting Seikos might be a nigh on impossible task! Anyway, to the SRP135 – the dial/hands combination in this case is I feel a mix of the sporty and the dress; a silvered dial speaks ‘dress’ yet the stubby, lume filled hands speak ‘sporty’. The combination works well with the time being readable at a glance – the reason for this as can be seen is the fact that Seiko have opted for a deep gunmetal coating for both the markers and the hands. The dial itself features a frosted silver finish with the finest of sunburst graining; contrasting this is a deeper silver band which adds a little interest to the dial but is in no way a distraction or in no way makes the dial busy. The finish is as I would expect from Seiko: excellent. Seconds/minutes are indicated by finely printed black hashes with luminous dots at the five hour markers. Thankfully, given that this is a silvered dial, the applied, faceted hour markers are of a polished gunmetal finish and can be seen at all times; the gunmetal finish applies to the hour and minute hands too thus this watch does not suffer at all from the ‘hard to tell the time’ syndrome so often seen with silver dial (and silver hands) watches. The seconds hand is actually black and this matches the rest of the dial/hand combination well. In addition, the applied day date surround reverts to the gunmetal of the other dial accoutrements, not only completing the balance of the dial as a whole, but also serving to blend in the black on white day/date indicators. Luminosity wise, there is generous fill to the main timekeeping hands and poor light performance is more than adequate. Whilst the luminous dots at the hour markers do their job quite well, obviously they will never be as competent as those with more generous (larger) application but then this is a day to day sports watch as opposed to a fully fledged diver for example. 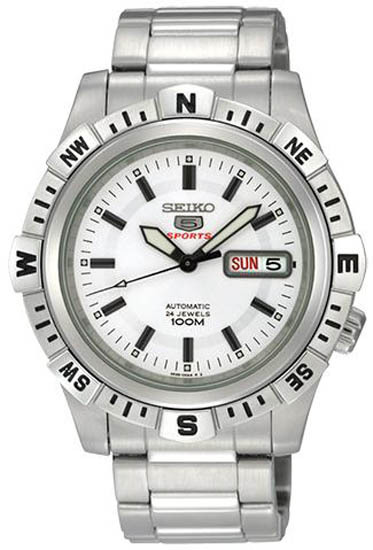 Seiko’s trademark silvered, applied logo and ‘5’ badge are in the usual place blow the 12, along with ‘Sports’ in red. Above the 6 we have ’24 Jewels’ – Automatic – 100m; all printing of the same is excellently applied, finely edged and certainly not obtrusive in any way at all. The overall look of the SRP135 is pleasing enough should you want a sporty watch with a little dressiness about it – present atop the dial as mentioned above is the standard Hardlex crystal which is thicker than standard Seiko 5s; this gives a satisfying thud when tapped with a fingernail. Seiko being Seiko, they tend to offer a varying combination of bezel/dial/hands within the same watch case and the SRP series is no exception. The family to which the SRP135 belongs has been available with ‘explorer’ dials (black and green), with an all IP finish, with IP bezel only, with gold plated bezel and so on; something for every taste! I happen to have the SRP143 in hand which is one of the explorer dial models; as can be seen, the black 3,6,9 dial gives the watch an altogether more sporty (rugged?) appearance and goes to show just how versatile the overall watch design is. The SRP143 features a gloss black dial base with classic explorer markers which are all Lumibrite coated; the silvered hands likewise are generously filled and in the style of what are now classic Seiko diver hands (bar the absence of the ‘pointer’ on the hour hand). The splash of red at the tip of the seconds hand complements the red ‘Sports’ moniker under the ‘5’ badge and I am pleased to see white on black day/date indicators in this case. As it should be, a quick glance at the watch is enough to tell the time but the dressier SRP135 is no worse in this regard, thanks to Seiko’s foresight in introducing a little gunmetal into the mix. Both watches feel solid, well constructed and well detailed – the case and bezel design suits either dial very well with neither looking out of place within the chunky case. I mentioned earlier about the lug width of 20mm – I would say that if the watch looks odd at all, then it is when a strap is attached as opposed to the bracelet – in this case, the thickness of the lugs in plan form is accentuated to a degree which I feel is slightly excessive and which to my eyes means that either the lug width should be 22mm or the lugs themselves should be a little thinner – in the case of the latter approach however, this might mean too much overhang of the bezel. This point is slightly academic however as the watches in hand are equipped with with a bracelet! Thus far with the SRP135 and SRP143 I am extremely impressed. The icing on the cake, or rather what really makes this watch work for me is the bracelet. Although the end pieces aren’t solid link, they are a lovely fit and truly look like they were designed for the watch – back to those lugs and the endlinks blend in nicely to the extent that any doubt as the aesthetics of the lug width quickly vanish. The bracelet itself is solid link with a (faux) three section plan form. Top finish is a combination brushed and polished finish with the polished sections not being too prominent as to be deemed ‘blingy’ in any way. The link sides are polished to match the case sides with the undersides being totaly brushed. Link removal is by way of split pins and there is no limit to the number of links that can be removed for a perfect fit; because of this, it should always be possible to position the clasp wherever one feels most comfortable on the underside of the wrist. Fine adjustment can be accomplished by way of the four adjustment holes on the clasp. What is welcome for me (having small wrists) is that the links are not overly large (or long so to speak) – thus, the bracelet will wrap around the wrist comfortably with nothing sticking out! Furthermore, once attached to the wrist, the wearer shouldn’t suffer popped clasp issues as the SRP135 is equipped with a pushbutton folding clasp replete with a (Seiko signed) safety catch. The bracelet as whole is very nicely executed and adds quite some heft to the watch; once on the wrist, the whole is very comfortable but by no means a lightweight -without doubt the SRP135/143 is a solid piece which feels like it will take what it is given without too much complaint. The Seiko SRP135 is a great choice for an everyday sports watch which will never need batteries. Benefitting from good attention to detail and excellent fit and finish, it would certainly seem to punch above its price point; not too big and not too small but with generous heft, it strikes me as something that designwise might have come from the Breitling stable – a Seitling perhaps?! It should do all you want and will be equally at home if you are wearing jeans and tee shirt, a business suit or indeed a pair of swimming trunks. Tagged 4R36, Seiko, Seiko SRP. Bookmark the permalink.